ABOVE : Hunter Instructor working with pupils from The King John School, Thundersley on a survival programme for Years 7-9. ABOVE : Campcraft skills weekend at Asheldham - in January - all the men! It certainly sorted people out. Hunter Outdoor Training does not advertise its services. We operate on reputation, recommendation, and referral. Hunter Outdoor Training was conceived way back in the 80's (see 'Biography'), and today is a major player in providing quality, bespoke, on-site, outdoor training and education for schools, courses for businesses, expedition emergency aid, and wilderness expeditions across the UK and Scandinavia. 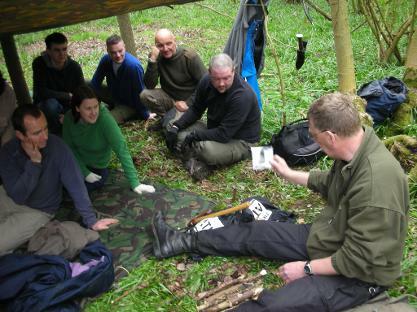 We are the only provider of on-site schools' outdoor education and training. My instructors who staff these courses are all hand-picked and bring a raft of other life-skills to the company, from a variety of disciplines. They are national governing-body qualified and accreditted, and also assessed in-house. On the basis that they work at the 'sharp-end' managing people, situations, and crises every day - outdoors - their repertoire is considerable, their experience quite simply is priceless. Hunter is in business to open-up - decode, interpret and explain - the outdoors to people....to create that "Wow!" factor, and to see our clients want to learn and experience more and more of the outdoors. We want to challenge and consolidate clients' learning; we also break the mould of normal outdoor training companies by being fully involved long before the start of a course on a personal level with clients to establish exactly what sort of course it is that they want - and how to get the best out of us, them, and the landscape. Hunter's multi-award winning history speaks for itself. Clients re-book Hunter regularly. We are also at the stage of working with clients who are ten-generations of recommendation away from an original client...and so it goes on. ABOVE: one-to-one Hillcraft-Masterclass on Dartmoor in very low visibility (hence the poor image).